Another installation at this year's International Garden Festival at Jardins de Métis/Reford Gardens is Soundfield by Doug Moffat and Steve Bates. As visitors wander through the site they will become aware of slowly shifting and changing sounds that are familiar but not clearly identifiable – the buzz of insects, perhaps, or white noise from a radio. Five sensors capture changes in wind speed and direction that are then translated into subtle changes in the sounds broadcast through a grid of small speakers and amplifiers that are distributed throughout the site. A conversation develops as the trees whisper back and the electronic sound field changes in response. 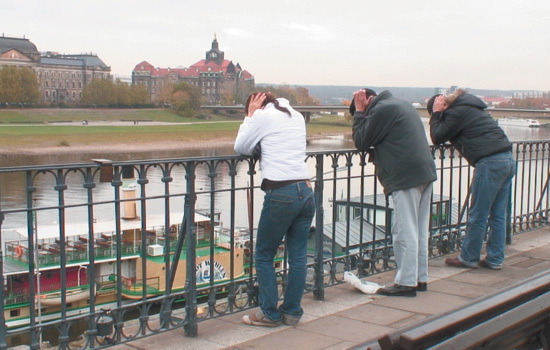 Consider, as well, Markus Kison's touched echo, a site specific sound installation attached to iron railings on a hill overlooking the city of Dresden. There, the public can hear the recreated aural landscape of Dresden during a nighttime bombing raid in 1945. But to listen in to the sounds of airplanes droning and of sirens wailing and of bombs whistling as they fall to earth and then exploding, you have rest your elbows on the iron railings and cup your hands over ears. 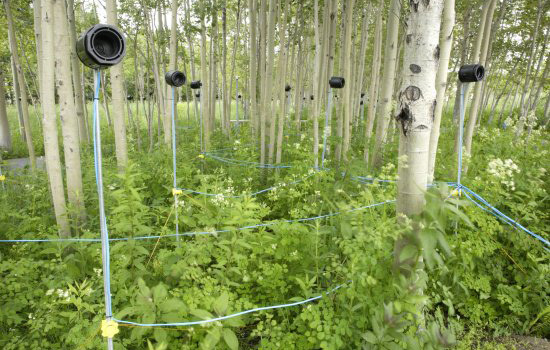 Combining these two other installations, perhaps one could imagine a re-working of the first so that rather than the recording and listening devices scattered about the place, they are implanted into the trees. And instead of sitting on a bench or just standing there having reconstituted ambient noises blasted at you, there is a more direct, physical engagement: you cup your hands and let elbow and bark touch. Or you press your ear against the trunks to hear the soundtrack. And yes, you can even hug them, letting the vibrations course through your body — reverberating through your bones and echoing through the chambers of your lungs until they hit an ear drum, much changed and re-sampled by your own body. It's a Forestry and Anatomy mashup. To hear the sunless interiors of their roots, you'll have to lie down flat on the ground, on your stomach, your ear pressed against the soil. And who knows, perhaps the sound emanating from the earth and then filtered through a certain body type may sound incredibly like the otherworldly harmonics of Jupiter. Cliché overload: "intervention", "frames", "experience", "conversation", "site-specific", "engagement". I don't mean to be snarky, but some of these descriptions are so post-whatever that they make the installations sound dated already. Ain't snarky. Just classically wearisome. Weary or not, it's great to see our project on Pruned. Douglas, will try my best trek up there this year and experience all the installations in person myself. And just to be clear, it wasn't your project that I was referring to in my comment above, rather to the first comment.